Few aquarists can say they haven’t dealt with an algae outbreak at some point in their fishkeeping ‘career’. With the many types of algae out there, it’s only a matter of time until you find some in your own tank. Algae growth is not necessarily a sign you’re doing something wrong, but you do have to find the underlying cause of the outbreak to resolve it. To make getting rid of pesky aquarium algae a little easier, we’ve put together this handy aquarium algae guide. Keep reading to find out the most common types of algae and, more importantly, their causes and the best ways to make them disappear! One of the most well-known types of algae to pop up in the aquarium, hair algae is characterized by the stringy green appearance it lends its name from. It’s a fast grower that can cover your entire tank at an impressive speed, causing your plants to suffer from lack of light and nutrients. Green algae in itself is not dangerous to your stock, but if you don’t want your underwater garden to suffer you’ll have to figure out how to get rid of it. 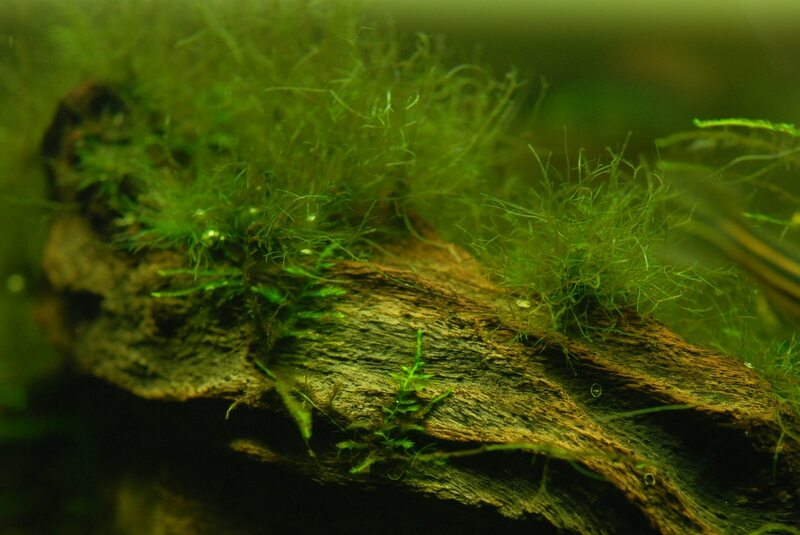 Hair algae is caused by a nutrient imbalance in your aquarium. It’s most commonly associated with a lack of Co2. If there is not enough Co2 present for all your plants while the lights are on, the algae gets the chance to take over. If green hair algae is caused by too little Co2 being present in the water column, there’s two ways to solve this imbalance and get rid of it once and for all. The first solution makes sense: add more Co2. This can be done by installing a pressurized Co2 system, which is especially designed for aquariums. If used right, a Co2 system will definitely give your plants the boost they need to battle hair algae. If you don’t have the resources to set up a Co2 system, the alternative to adding more Co2 is to reduce the demand on Co2. This is done by reducing the lighting cycle, giving the plants less growing time and therefore making sure they need less nutrients. Do keep in mind this solution only works for low-maintenance plants, as species that need a lot of light will simply wither away if you go this route. To manually remove hair algae, try collecting the largest strands by twisting them around a fork or even just your finger. They can then easily be pulled out of the tank. Whatever is left can be removed using a coarse sponge or a scraper, depending on the surface. Hair algae attached to plants can be hard to remove without damaging the plant, so you might have to wait until your adjustments to the Co2 balance have done the trick. We use green algae as a collective name for all the algae types that are green in color and attached to the aquarium glass and decor, with the exception of hair algae. Although these algae can take different forms (from dusty and easily wiped away to very stubborn), all are similar. Green algae is harmless but can be very annoying to deal with. We keep our aquarium in order to enjoy seeing our fish and plants, after all, which is difficult if the glass is covered in a layer of green. If you don’t deal with the underlying cause of this film, it will keep coming back no matter how often you have a go at it with the algae scraper. Green algae coats are associated with high-light aquariums. An aquarium that gets a lot of natural light in the form of direct sun, for example, is vulnerable to an outbreak. Additional common causes of green algae are a lack of Co2 and an imbalance in or lack of macronutrients. Did you know? Some fishkeepers grow green algae on purpose. The green layer houses many micro-organisms, which form an important part of some fish species’ diet. Otocinclus catfish and hillstream loaches will appreciate the result of leaving a rock in high light underwater conditions for a few weeks: a thick green algae feast. You’ll almost always find some spots of green algae in your aquarium, especially if the lighting cycle is long and/or the lights you’re using are strong. Some aquarists consider this a sign of a healthy tank, but obviously things shouldn’t get out of hand. If you’re finding more green algae than you’d like in your tank, do a water test to check whether there is an excess or lack of common nutrients. As mentioned above, nitrates, phosphates and potassium are associated with green algae growth. Additionally, you might want to check if you’re not leaving the aquarium lights on for longer than needed. Green algae are a favorite among many herbivorous aquarium inhabitants. Although you shouldn’t expect a fish or invertebrate to solve an algae problem in your aquarium, some critters can at least help you out. Nerite snails, amano shrimp and the tiny Otocinclus catfish are some of our favorite algae eaters. Brown algae is probably one of the most frustrating types out there. It’s not just stubborn but also ugly, covering all surfaces including the aquarium’s window panes in a brown-green, gunky film. One fact that’s important to understand what brown algae is and how to get rid of it is that despite the common name, this is not actually a type of algae like the others on this list. Rather, it’s a massive colony of diatoms that start blooming when there is an excess of certain substances in the water column. Brown algae are commonly associated with new aquariums. During the cycling process you’ll almost always see some spots appear. But why? The unicellular diatom colonies that make up brown algae blooms feed on silicates. These silicates are present in tap water, which means the diatoms have plenty to eat in new aquariums that have just been filled with 100% tap water. This is also the reason aquariums that require large water changes on a weekly basis have a greater chance of becoming home to a thick film of brown algae: you keep adding large quantities of tap water, allowing the brown algae to thrive. Like real algae, brown algae diatoms also appear in aquariums that contain excesses of nitrates, phosphates and light. If you’re dealing with brown algae in a new aquarium, your best option is unfortunately to just wait things out. In the meantime, you can use an algae scrubber or scraper to remove stains you can reach easily. Things should clear up soon enough. If your aquarium is well-established but still getting covered in brown algae, it’s time for a water test, as you might be dealing with high nitrates or phosphates. Also review your lighting cycle: if you don’t have your aquarium on a timer it can be tempting to leave the lights on from when you wake up until you go to bed again, but this is unfortunately too long and can promote algae growth. Also known as brush algae, black beard algae can be quite an annoying occurrence in the aquarium. Presenting itself as dark grey beard-like tufts that stick to décor and equipment, what makes this algae type such a nuisance is how firmly it attaches itself. It can be quite difficult to remove black beard algae, especially when it grows on delicate surfaces like plant leaves. What causes black beard algae? Similar to hair algae, the appearance of black beard algae is generally associated with a Co2 imbalance. Additionally, there might be another nutrient imbalance going on in the aquarium: anything that throws off your plants is a recipe for algae growth. If you’ve discovered black bear algae in your aquarium, your best initial option is to do a water test. Make sure the water is clean and free of excess nutrients like nitrates and phosphates. If you find either of these have built up, adjust your water change schedule accordingly to prevent it from happening again in the future. In case of a Co2 imbalance, as mentioned in the section on hair algae, there are two options. You’ll have to look into installing a Co2 system to make sure there is enough Co2 present for your plants to effectively photosynthesize and compete with the algae. Alternatively, you can opt to reduce your lighting cycle so there is less strain on the Co2 supply. High-light plants won’t appreciate this, though, so if you grow demanding species in your tank you’ll likely have to opt for the Co2 system. If you frequently swim in natural waters during the hot summer months you might know blue green algae (also more correctly known as cyanobacteria) as the pesky stuff that can cause an entire lake to be closed off to swimmers. Coming into contact with this bacteria build-up can make you violently ill. Though not dangerous to you when it’s present in your aquarium, blue green algae can still be a huge nuisance. It can cover your tank in a blanket of putrid smelling slime in a matter of days. Although it’s easily removed with a hose, trying to get rid of it without solving the underlying cause won’t be useful: it’ll return with a vengeance. A large infestation can be problematic, as the cyanobacteria leave the water low in oxygen. A small amount of blue green algae will be present in many an aquarium and shouldn’t usually pose a problem. The issue starts when a bloom is triggered and the slime layer starts taking over your tank. As you probably guessed by now, excess nutrients or a lack of Co2 can trigger a cyanobacteria bloom. In addition to a nutrient imbalance, blue green algae growth can be triggered by cycle bumps. A lack of beneficial bacteria and other microflora means less competition for the cyanobacteria, allowing them to take over. This is why you’ll often see this “algae” type pop up in new aquariums that are still in the cycling process, subsequently disappearing once the bacteria populations have stabilized. As always, test your water and take a critical look at your water change schedule and nutrient dosing. Is everything balanced? Should you be cleaning the aquarium a little more, or maybe bump up the Co2? Because blue green algae also occur in cases where the beneficial bacteria colony naturally present in the aquarium filter and substrate are disturbed, it can be helpful in some cases to dose bottled bacteria. Once you’ve dealt with the most probable underlying culprit, you can opt to do a ‘black-out treatment’ to get rid of the majority of the blue green algae at once. This involves leaving the aquarium lights off and covering the tank for a number of days. Aquarists have also had success with algicides and just plain old scrubbing. As the name suggests, green water is when your aquarium water suddenly appears to turn into something most appropriately described as pea soup. Although some aquarists actually put a lot of work into cultivating nutritionally rich green water for their live food colonies or fancy goldfish, it’s something that can definitely send those who were not prepared for it into a slight panic. Although green water is not dangerous to your fish, it’s definitely alarming. Green water is caused by a microscopic, free-floating algae type. This phytoplankton is a natural part of your aquarium and many natural habitats, but certain conditions can cause it to bloom and turn your aquarium water completely green. The causes for green water are relatively standard for algae. Nutrient imbalances, such as those from inadequate maintenance, as well as lack of Co2/excess light are surefire ways to cultivate soupy green water. Green water is one of the easiest algae infestations to get rid of. Because the algae float, we can catch and remove them in a few different ways. The most common solution is to temporarily use a UV sterilizing tool, which is a bit of an investment but will have your water back to being crystal clear before you know it. Alternatively, you could try adding some filter floss to your filter and replace this weekly, as the fine material of floss will catch tiny particles much more effectively than sponge. Keep in mind that if you don’t get the underlying cause under control, the green water will simply return. Always do some testing and judge whether you need to improve your maintenance schedule. Annoying, that’s what it is! Cladophora algae is an algae type characterized by its long, stringy growth pattern. Its hair-like strands can form dense balls that choke out your plants and are extremely stubborn. Trying to get rid of them usually results in a clean looking tank for a maximum of a few days, after which a few leftover strands can start the infestation all over again. If you’re unsure whether you’re dealing with Cladophora or hair algae, all you have to do is put your nose close to the culprit. But be prepared… Cladophora is notorious for smelling very bad! Most aquarists suspect that Cladophora is generally a hitchhiker that enters the aquarium with the introduction of ‘infected’ plants. In aquascape-type aquariums with high light conditions and plenty of nutrients (especially when they’re unbalanced), this algae can grow alarmingly quickly. Because Cladophora algae even grows when your parameters are normal, this is probably the only algae type where we can’t urge you to fix the underlying causes. Once it’s in your aquarium is in there, and the only way to make it disappear is to kill off every single strand. There are various recommended options for getting rid of Cladophora algae, but none that eradicate the infestation easily. It’s unfortunately always going to be a difficult task and you might find the dreaded strands pop up again as if nothing happened even though you were entirely sure you got them all. You can remove Cladophora by hand, but since strands will almost always break off it’ll likely reappear in other places. What most aquarists do instead is spot treatment: squirting a dose of liquid Co2 or hydrogen peroxide in the center of a tuft of Cladophora in order to kill it. Repeat this process for as long as you see new strings appearing in your tank. Staghorn algae falls into the category of red algae like its similar cousin, black beard algae. The greyish coloration of both algae varieties are very similar, but they can be told apart by looking at the growth pattern. Black beard algae grows in shorter tufts, while staghorn algae threads can attain a longer and more bushy appearance. As the name suggests, the latter tends to take on an antler-like shape. Like black beard algae, staghorn algae grows on surfaces like equipment and plant leaves. It can be quite difficult to wipe off and you’ll often need a blade to do so. Excessive growth of staghorn algae is generally associated with three factors: a lack of Co2, accumulation of nutrients due to lack of maintenance and poor water flow. Removing staghorn algae manually isn’t an easy task, especially when it’s attached to fragile plant leaves that will break when scrubbed too vigorously. To make matters worse, algae eating fish and invertebrates usually show very little interest in it, so they won’t be of much help in keeping an outbreak under control. Luckily, staghorn algae is considered relatively easy to wipe out by dosing a liquid Co2 product. Additionally, you can try using hydrogen peroxide squirted directly into tufts of this pesky grey menace. Whichever method you try, keep in mind that the appearance of large amounts of staghorn algae in your aquarium can be a sign that something is wrong. You might need to clean your filter and do tank maintenance more often or adjust a severe imbalance in Co2 (due to leaving the lights on too long every day, for example). Failure to take proper measures can mean staghorn algae will return just as fast as you can remove it. Basically a sharp razor mounted sturdily on a long stick, this tool allows you to efficiently remove algae from flat surfaces like the glass tank panes. It doesn’t come with the risk of trapping sand and scratching the glass like some other tools. You can use this for even the most stubborn types of algae, like hard to remove beard- and staghorn algae. Similar to an algae scraper in design but with a sponge end instead of a blade, this tool works best for the softer types of algae (such as green algae) that can attach themselves to the aquarium glass. An advantage is that it’s a little easier to use on non-flat surfaces. A very handy invention that involves two magnetic parts sandwiching the aquarium’s glass panes. The magnet allows you to effectively scrub the inside of the glass without having to get your hands wet. Do keep away from the substrate if you’re using sand, because just one grain getting stuck between the magnets can wreak havoc on glass. This is a product normally used to encourage plant growth, but it also makes a handy ally in the fight against algae. For some types of algae, it’s recommended to dose the entire aquarium with a liquid Co2 product. Alternatively, it might help to spot treat by dosing directly onto a patch of algae. Similar in use to liquid Co2, although this compound is only used for spot treatment. It can be harmful to aquatic life, so be sure not to use any more than you need to tackle the algae. Though not a wonder cure for algae trouble, algicides do what they promise and can take out unwanted green growth. Do keep in mind that some brands can be quite harsh, taking a toll on some plants and even proving fatal to sensitive invertebrates. It’s recommended to research any products before using them and consider trying other methods first if that’s an option. Don’t impulse buy fish, for multiple reasons. Any species should be researched thoroughly before buying and needs to match the rest of your stock as well as the aquarium itself in order to prevent trouble. Most well-known algae eaters only eat certain types of algae, and they can stop grazing entirely when they get used to commercial pellet and flake foods. Additionally, many fish marketed as ‘algae eaters’ don’t even actually have algae on their menu! All in all, the only one that can fix an algae problem is you, not a fish, shrimp or snail. That being said, if an algae eater fits into your aquarium set-up and won’t cause trouble, a little assistance is never a bad thing. Don’t settle for “easy fixes”, because although they can be quite effective they do nothing about the underlying problem that caused the algae outbreak in the first place. A black-out treatment where the aquarium is kept completely dark for a number of days, for example, is a surefire way to wipe out algae. However, if you continue to skip water changes after doing one, all you’ll really have achieved is stress out your fish and plants: excess nutrients are still present and the algae will be back before you know it. Don’t be scared of a little algae. A sparkly, squeaky clean aquarium like the ones you see in aquascaping photos and Instagrammers’ videos is usually freshly scrubbed. It’s absolutely normal to find a little scum on the glass after a week, that’s why we have algae removal equipment! Keep your aquarium clean, doing at least a weekly water change. Additionally, don’t forget to gently clean the filter material on a regular basis and use a siphon to remove debris from the substrate. Nitrates and phosphates building up due to lack of maintenance can really encourage algae growth. Use live plants. Many (beginning) aquarists are worried their black thumb will get in the way of keeping a successful planted tank. There are many surprisingly easy live plants out there, though, and they really help in the fight against algae. Plants absorb nutrients that would otherwise be used by algae, basically outcompeting them so a full-blown outbreak is less likely. To summarize all of the above, algae are a normal part of any aquarium and nothing to worry about in many cases. Even if you end up dealing with a large outbreak, you’ll often be able to reduce or get rid of the algae completely relatively easily. The battle against algae starts with identifying the variety you’re dealing with, which this guide can help you with. Nutrient and Co2 imbalances are most commonly associated with the majority of algae varieties, so start with testing your water values, the Co2 concentration and your lighting cycle. Additionally, many species have other weaknesses, like the inability to deal with overdoses of liquid Co2 and hydrogen peroxide, which you can use to your advantage.